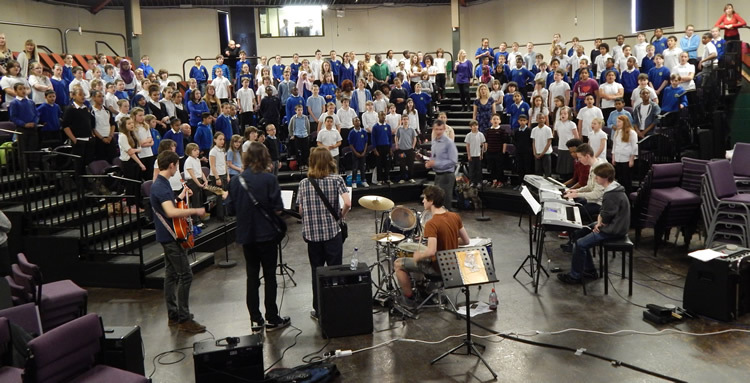 We linked up with a local secondary school and took 180 year 5/6 children to record a CD of our 6 times tables tunes with a live band of year 12 students. As well as being an amazing experience for everyone, this contributed to the students’ A-level portfolios (modules on music performance and music in the community). It was an amazing day and we now have masses of ideas of how to collaborate further! Our ideas involve Maths, English, Music and Business Studies across both schools. I’ll blog about it if/when things happen. Although you don’t need to be a music specialist to run the times table project in your school, you do need someone skilled in music to run the collaboration. This could be a primary or secondary teacher, or even the music students. I created musical arrangements using Sibelius, which exports pdf files and sound files of the whole tune and of each individual part, so the A-level students could prepare in advance. I then went to 5 hours of A-level music lessons to rehearse. The recordings are in the Teacher Resources section of this blog.